In the previous series of blogs the read and update on Opportunity header fields are discussed. In this blog another scenario will be explained: create scenario on Opportunity header fields. I will again use Closing Date ( and description field ) for example. ls_saved            LIKE LINE OF lt_saved. ls_orderadm_h_com-description = 'created by code on:' && sy-timlo. INSERT ls_input_field INTO TABLE lt_input_fields. WRITE:/ 'Order maintain function is done successfully.'. INSERT lv_guid INTO TABLE lt_save. WRITE: / 'Opportunity created failed'. READ TABLE lt_saved INTO ls_saved INDEX 1. WRITE: / 'Opportunity created successfully, id: ' , ls_saved-object_id. Once executed, a new Opportunity will be created. Just like FILL_OW, CHANGE_OW, MERGE_OW, SAVE_EC and READ_OB which are already discussed below, there are another kinds of function module responsible for creation in One Order, whose naming convention is CRM*CREATE_OW. Execute the report in this blog via SAT to study how CREATE_OW works. (1) The main logic within this header administrative information creation function module is to create status object. in CRM_STATUS_OBJECT_CREATE, lots of status related internal table are populated as buffer, and they will be persisted to database table by subroutine STATUS_UPDATE once commit work is called. 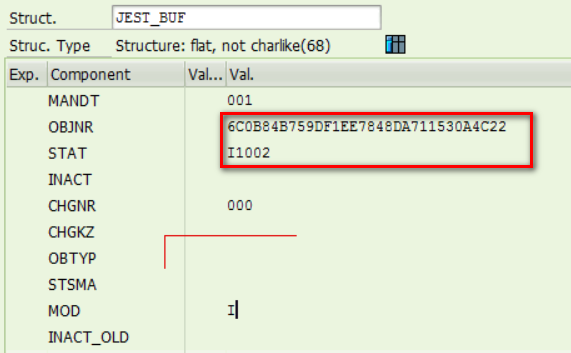 Take internal table jest_buf for example, we will check whether we could find the corresponding entry for below record later in table CRM_JEST with objnr = 6C0B84B759DF1EE7848DA711530A4C22. This header administrative data does not contain any transaction specific field like Closing Date in Opportunity header, which will be handled by CRM_OPPORT_H_*_OW function module instead. From the gross execution time of this function module ( only 10 microseconds ) we can assume that no heavy logic is written within it. In fact it only inserts the following three fields to OPPORT_H object buffer and that’s all. The left logic are done in CRM_OPPORT_H_CHANGE_OW which has already been discussed in this blog: Logic of CHANGE_OW function module in One Order. 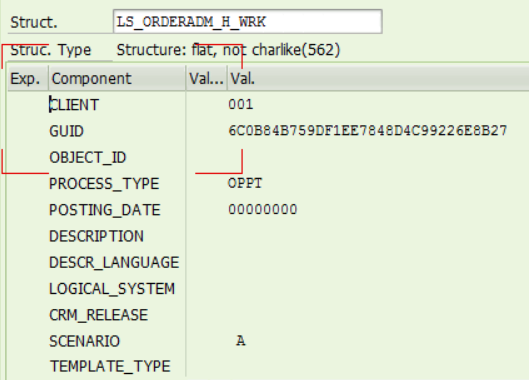 After report is executed successfully, go to table CRM_JEST and query objnr with guid 6C0B84B759DF1EE7848DA711530A4C22, and there is indeed one entry which are created by CRM_STATUS_OBJECT_CREATE in CRM_ORDERADM_H_CREATE_OW. You may have doubt that in this test report, Opportunity start date is not specified explicitly, why finally it has value 2017-03-24? 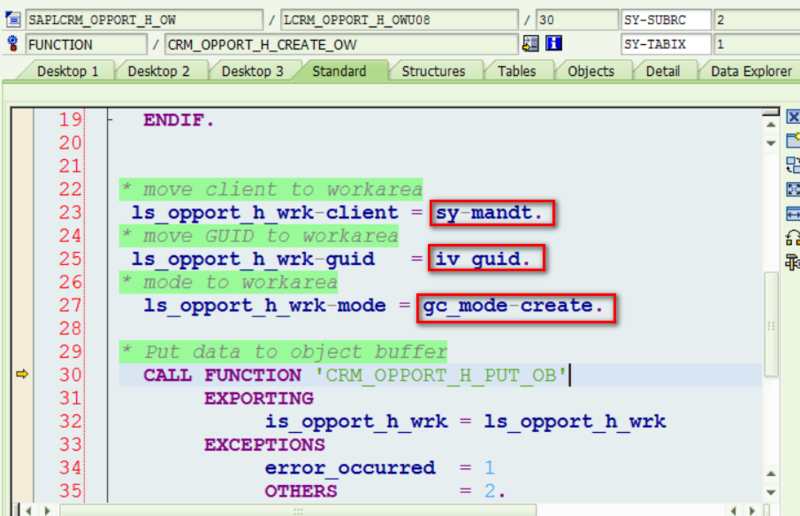 It is hard code in CRM_OPPORT_H_MERGE_OW, if no value specified by consumer. I have written a series of blogs to explain how One Order API works. The blogs are written based on a simple scenario: read, change and save field “Closing Date” in Opportunity header level.